Among the more surprising and shocking headlines of last week was the decision of Minnesota governor Mark Dayton to veto a $1.5 million two-year state grant for Teach for America. The Minnesota grant wasn’t to pay TFA for a program or contract with TFA for services. It was simply $1.5 million slipped into a higher-education funding bill as an earmark for TFA. However, Crystal Brakke, the executive director of the Twin Cities branch of TFA, explained that every TFA unit is responsible for raising 80 percent of its funding locally and would have used the Minnesota grant to expand its in-state programs. However, no explicit quid-pro-quo for the funding appears to have been contained in the legislation. Rarely if ever does any public official deny TFA anything. Remember the hornet’s nest of controversy TFA stirred up when it feared it would lose a federal earmark as President Obama first took office? (TFA won the support of the President for its earmark.) A former public school teacher, Dayton questioned why the state of Minnesota would need to add $1.5 million to TFA which, as of 2011, had revenues of $270 million, total expenses of $219 million, and net assets of over $350 million. But Dayton’s primary concern seemed to be the earmarking itself. As he explained in his line-item veto letter, “My principal concern, however, is the way in which TFA was selected as the recipient of this grant. To my knowledge, no competitive grant program was established; no other applications were solicited; and no objective review was made by an independent panel of experts. Instead, the funds were inserted into the Senate’s Higher Education bill [and] directed to this organization.” Governor Dayton argued that if the state wanted to “encourage programs like TFA,” it should have a formal grant program to which all qualifying programs should apply. Brakke further explained that 15 other states fund or anticipate funding TFA in a manner like the funding item vetoed in Minnesota. It is simply one of the ways TFA raises money. In the blowback against Dayton, critics charged that he was opposing TFA because of his allegiance to the teachers unions that supported his past electoral campaign. 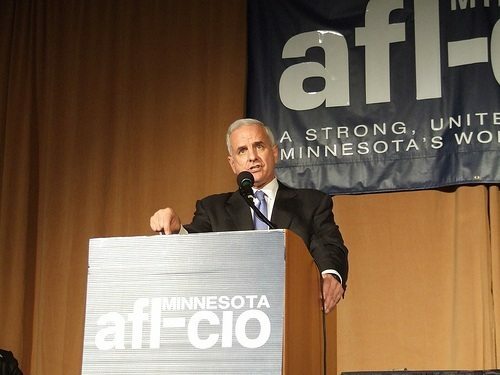 Last year, the National Education Association named Dayton “America’s Greatest Education Governor.” However, the immediate and virulent reaction against Dayton tied to the unions suggests that many people who support special funding for TFA see it as a bulwark against the unions. Early last week, the NPQ Newswire mentioned TFA’s New York City fundraiser, at which Kopp made it clear that the next mayor of New York City, whoever it might be, would be hard-pressed not to pursue the education reform agenda of outgoing mayor Michael Bloomberg, a staunch advocate of charter schools and other policies that TFA finds attractive. 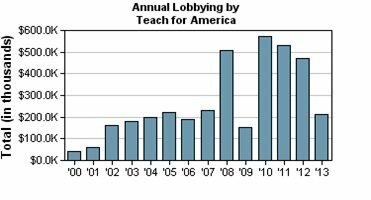 Despite its massive private sector funding prowess, and although it’s widely considered an icon of private sector social entrepreneurialism, we have long noted that TFA’s entrepreneurial success is quite evident in its ability to raise money from federal government sources, state governments, and local school districts.